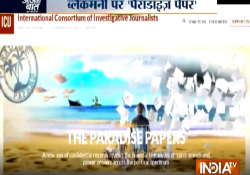 The Centre on Monday announced a multi-agency probe, involving Income Tax, Enforcement Directorate, Financial Intelligence Unit and RBI, into the ‘Paradise Papers’, which are leaked documents, running into millions, that allegedly show offshore dealings by hundreds of Indians. These documents have been revealed by an international collective of journalists, who pored over them for months, to sift details. The multi-agency group will match the information in the Paradise Papers to ascertain cases of tax evasion. The government has made it clear that there are several cases in which investigation is already being carried out, and the new cases will be added to the probe. The chairman of Central Board of Direct Taxes will head the multi-agency group. I hope the investigations will be carried out speedily, questions that are agitating the minds of people will be answered, and action will be taken.